Our biggest savings of the year! 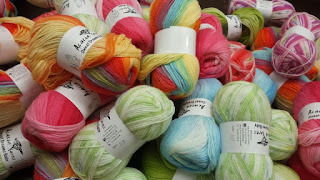 50% off a great selection of in-stock yarns all Labor Day Weekend, sale runs through close of business Monday. 50% off GGH and many discontinued yarns in our SALE ITEMS section of the website. 40% off Araucania and Ella Rae. Most of these products are not discontinued, we simply need to make more room for new yarns! Applies to in-stock yarns and quantities only. Sale price is reflected on the web site. Sale prices will not be extended to in-store purchases. Orders placed on the website may be marked for store pick-up. Orders will be filled in the order in which they are received, unfilled orders will be cancelled.